Hi Margo, Welcome to Café Cala. It’s great to have you visit Café Cala. I love what I’ve seen of your book and the fantastic illustrations and I’m intrigued that you co-author with your daughter, Emma. I’ve been making a raspberry and coconut loaf this morning. Would you like tea or coffee with yours? Yes, please I’d love a long black coffee. 1 Where did you get the idea for Mirabella the Mermaid Detective? Mirabella is based on a story I used to tell Emma when she was little. A few years ago we decided that we wanted to develop it further, so we made her a detective that lives on the Great Barrier Reef and wrote our first book about her first adventure. The most rewarding thing about writing Mirabella is getting to know the Great Barrier Reef and its amazing diversity of inhabitants. Every creature we feature is a real resident of the Reef, and we’ve carefully incorporated factual details so that the books are both entertaining and educational. We’ve always told stories together and when Emma started working in Film and Television it evolved into an official working partnership. Both of us had written independently, but always ran ideas past one another and realised that we should officially collaborate. Our relationship allows us to really explore and challenge ideas in a constructive way, because we know each other so well. We both have complementary skills and a shared vision for everything we work on, but that we each truly love and value the other is probably the best part of our writing partnership. Also, reading A LOT of good writing! We read film scripts, writing bibles, great fiction, great non-fiction – everything. Reading a lot of good writing is the most helpful tool to continually developing your craft. We’re currently working on Mirabella book 2 and 3, an animated factual web series and a dystopian future adult TV series. Write. Read good writing, as much as you can in the genre you want to write in. Explore the world and your own imagination so you have something to write about. Then write some more. Kids/YA – Wendy Harmer, Adrian McKinty, Aussie Chomps/Bites/Nibbles, J K Rowling, Kathryn Lasky, Suzanne Collins, Veronica Roth. Adult – Way too many to list! Writing references – Robert McKee ‘Story’, David Trottier ‘Screenwriter’s Bible’, Blake Snyder ‘Save the Cat’, Karl Iglesias ‘Writing for emotional impact’. Thanks a lot, Margo. I look forward to recommending Mirabella to my granddaughter. Mirabella the Mermaid Detective is a first chapter eBook, full of adventure and colourful illustrations, for 7-11 year olds who love solving mysteries. 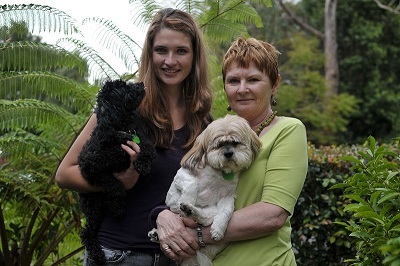 Margo & Emma Gibbs are a mother-daughter writing team from the Sunshine Coast in Queensland, Australia, who have been creating stories together ever-since Emma was very little (over 20 years ago). They both love reading, exploring the magical natural world around them, and secretly both wish that they were mermaids. Mirabella the Mermaid Detective is their first book.